It's time to start garden planning. I really love this part of the growing process! I get to thumb through seed catalogs and discover different varieties of my old favorite herbs and vegetables. I can spend hours planning out my garden deciding what goes where and how much I want to plant. Unfortunately, there's always something I want that I can't have. This year it's a soap nut tree. *sigh* I really want that tree. Unfortunately it would die over the first winter which is something I know because I checked my USDA hardiness zone. 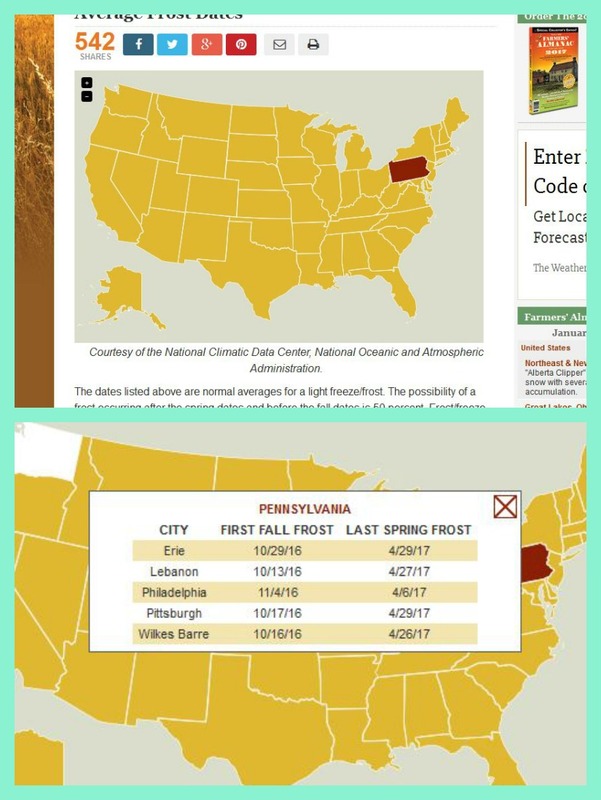 When is my last projected frost date? The answers to these questions will help determine what you can plant, and when you can start planting. Luckily the are really easy to find out. I'll show you how. There are two websites you're going to use. The first is the United States Department of Agriculture site. 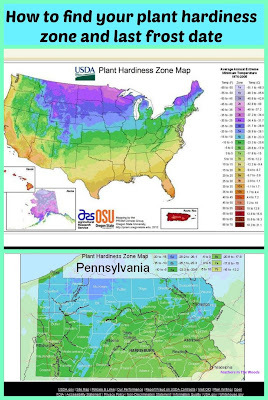 You want the plant hardiness zone map. Or just click right here: USDA to go to the map. Once on the map you simply click your state and it will blow up to full size so you can see where you are. There's a little chart on the top of the state map that tells you the zone number of each color. Most people will know right away where they are and what zone they're in. However if you're like me and live in the middle of nowhere without any landmarks, you'll want to pull up a second map. 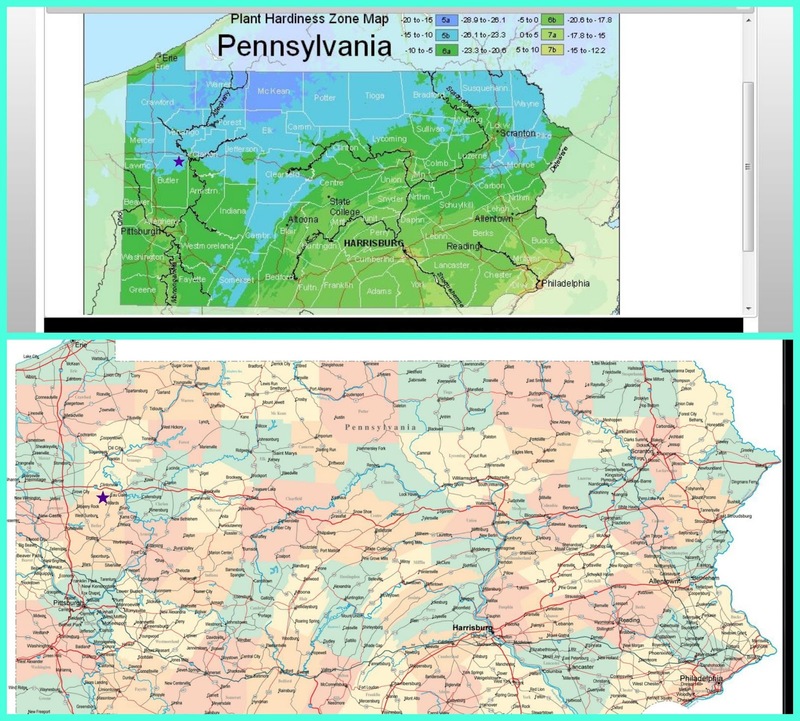 I did a google search for 'PA county road map' then I clicked images. Don't click maps, that won't work. Scroll through the images till you find one with both the counties outlined and some roadways and/or cities. You'll want to click the view image button. 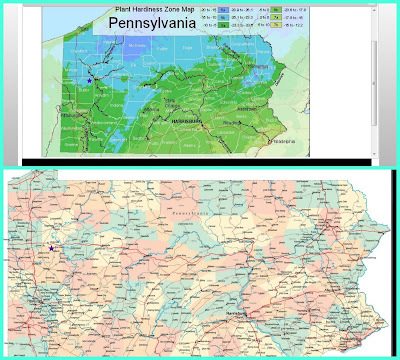 Once it's blown up full size you can find your hometown, then compare it to the USDA map to approximate your location. I marked my location on each map with a star. I am in zone 5B. Zones are divided by 10°F increments. Of course it would be colder at the bottom of the zone and warmer at the top, with variations for elevation. B refers to the bottom 5° of the zone with A being the top 5° degrees of the zone. If you happen to be out and about and forget what zone you're in, a tiny multi color map is printed on the back of most seed packets. The next thing you need to figure out is your approximate last frost date. Of course these are educated guesses not facts so you'll still need to keep an eye on the weather, but it's usually a pretty close guess. I happen to like the Farmers Almanac website for this one. Once there you need the Average Frost Dates map. This map works the same way the last one did. You just click on your state and a little window pops up. Not every city is reported so you're might do a tiny bit of guesswork. My little town is not listed but I am smack dab in the middle between Pittsburgh and Erie. As you can see both cities are calling for a last frost date of 4/29 so it's pretty safe to say that's the date for my area. Of course, there have been years that the last frost was 2 weeks early and other years where it was a week late. (last year *sigh*) Keep an eye on the weather and keep some light sheets or thin plastic, flannel backed tablecloths to throw over plants in the event of a late frost. I end up covering the grapes almost every year. Now that you have these 2 pieces of information what good are they? Well, they tell you what will and will not grow in your area. Certain trees will not overwinter in colder areas, like that soap nut tree I want. My lemongrass does great outside for all but 5 months of the year but then it must come inside or die from frost. Luckily, I read the tag and knew this when I got it. I bought it a giant lightweight pot for easy moving. You can find information on particular plants on seed packets or plant tags. They usually say something like 'Hardy to zone 6'. Or 'direct seed when all danger of frost has passed'. These numbers can help you choose a variety that fits your growing season. Everything from tomatoes, to corn, beans and even eggplant has a 'days till maturity' listed on the package. You can get 55 day carrots or 75 day carrots. Knowing how long your growing season is helps you to chose a variety that has time to mature before the season ends. We have an average of 6 months frost free in our growing season. Even though that seems like a long time, the heat of summer often causes certain plants to quit producing. My broccoli always bolts the first really hot week we have. Broccoli is one of the things I like to start early so I can get in the ground as soon as possible. This way I'll be able to harvest it before the heat destroys it. I can start broccoli inside in mid February and the plants will already be close to 3 months old when they go in the ground. Cucumbers don't do well in the heat of summer either. I aim to be wrapping up the cucumber harvest when the real heat hits. These numbers also help you to choose varieties of other vegetables that you'll direct seed. They can also help you decide which varieties you can plant in secession for two harvests. I can usually coax a second set of broccoli out of the garden by starting the seeds indoors at the beginning of the summer heat. When it starts to cool down, I move them to the garden where they start producing in a month or so. Are you ready to get serious about tracking your garden progress this year? Check out the Vegetable Garden Planner that I've been using. It's a downloadable planner that you can print out and track your entire garden season, the good and the bad...and it's half off right now! This is great info! I am still working on my gardening skills (livestock is more my speed usually) so this helps me out a lot! Thanks for sharing on the Homestead Blog Hop! This is great information. Thanks for sharing on the Waste Less Wednesday Blog Hop.